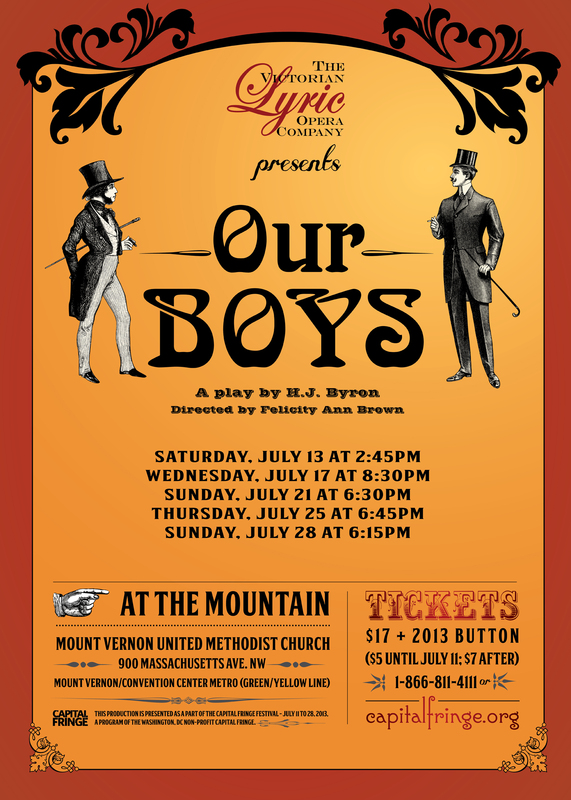 DCMetroTheaterArts rates Our Boys as "Best of the Fringe" with 4 1/2 stars! The Victorian Lyric Opera Company returns to Capital Fringe with yet another Victorian-era comedy. Our Boys was first performed in London on 16 January 1875 at the Vaudeville Theatre. Until it was surpassed by the run of Charley's Aunt in the 1890s, it was the world's longest-running play, up to that time, with 1,362 performances until April 1879. It also ran in the U.S. at the Chestnut Street Theatre, Philadelphia, the whole Centennial summer June 26 - November 18, 1876. The show has since slipped away into history...until now. Read DC Metro Theater Arts preview article on Our Boys here. Read The Gazette's preview article on Our Boys here. "...so, with many thanks for past favours, 'bye-bye, Bacon'"
A program of the Washington, DC non-profit Capital Fringe. Single tickets for Fringe are $17 (plus a one-time purchase of a $7 Fringe Button. You must have a button to enter all Fringe venues, but they get you discounts at many local businesses). Multi-Show Passes range from $30 to $300.